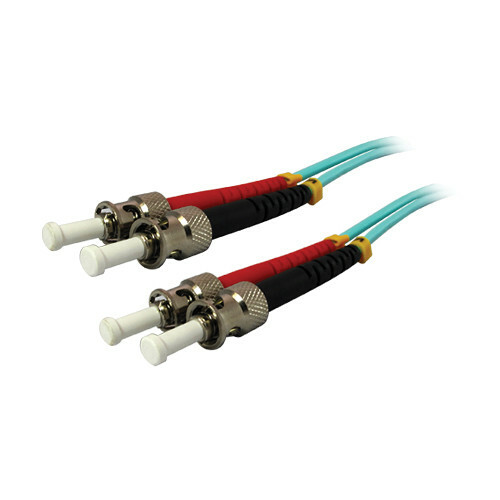 The aqua colored 32.8' 10GB ST/ST Duplex 50/125 Multimode Fiber Patch Cable from Comprehensive is a laser-optimized multimode fiber (LOMMF) cable that provides backward compatibility with existing 50/125 equipment while providing the performance headroom required to support laser light sources and 10 Gigabit applications. This Optical Multimode 3 (OM3) fiber cable supports 2,000 MHz/km EMB at 850nm, and provides 10 Gigabit transfers up to 984.2' (300m) using an 850nm VCSEL source. The aqua colored jacket is PVC (OFNR-rated). Box Dimensions (LxWxH) 7.1 x 7.0 x 0.5"